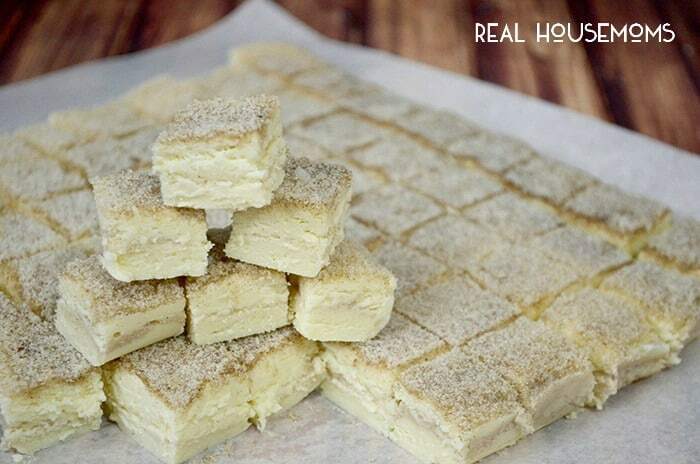 Turn your favorite cookie into a decedant bite with just a few ingredients and this SNICKERDOODLE FUDGE recipe! It’s the holidays and along with this brings on all kinds of delicious and fantastic candy and cookie recipes! I have made fudge since I was in my tweens! The flavors back then were pretty simple. Today they are amazing and fantastic flavor combinations! 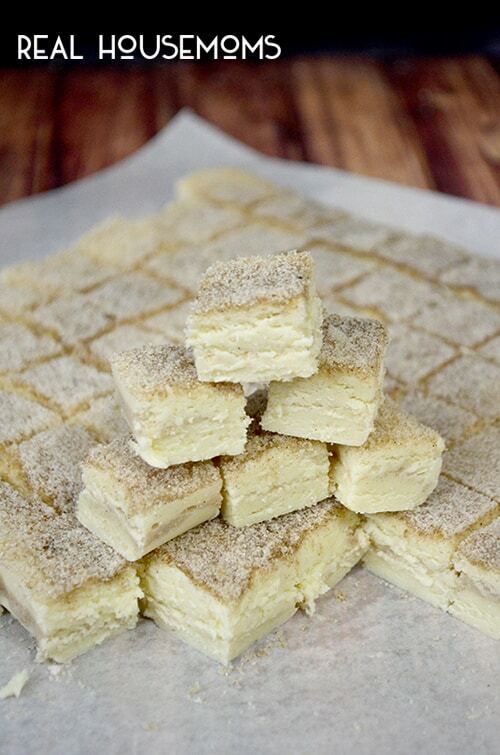 Today I have a delicious cinnamony Snickerdoodle Fudge recipe for you! I hate making traditional fudge, the stirring, the pot watching the waiting! Now the only fudge recipe I use starts with a 12 oz bag of chocolate chips and a can of premade frosting! There are a couple of reasons I use this recipe. Besides the obvious of it being so easy, the unlimited combinations of flavors and it being shelf stable make it my favorite! 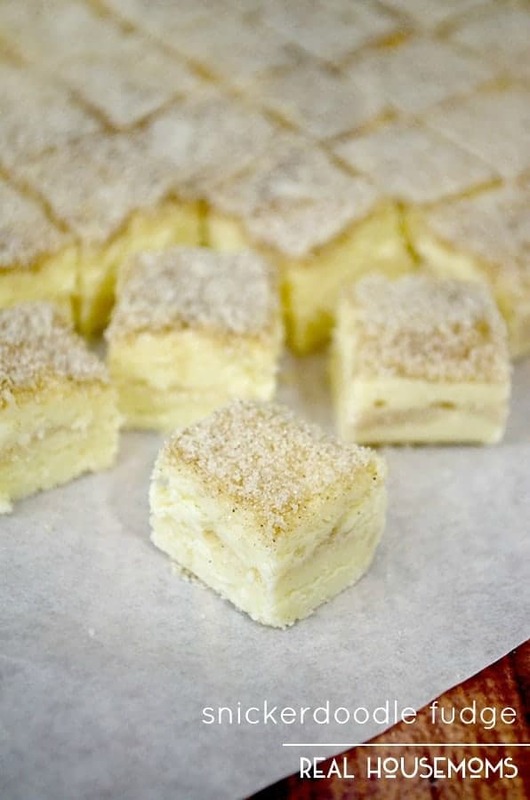 With this Snickerdoodle Fudge I used white chocolate chips and cream cheese frosting! I love the cinnamon ribbon in the middle of the fudge and the cinnamon sugar crust on the top! With the addition of the cream of tarter in this recipe you get the iconic tangy flavor of the traditional snickerdoodle cookie! There is more to the snickerdoodle flavor than just the cinnamon! Well that’s my opinion anyway. Line an 8-inch x 8-inch baking pan with foil or parchment paper, leaving some hanging over the edge. Set aside. Mix cinnamon and sugar in small bowl until mixed thoroughly; set aside. Place container of frosting in a microwave, heat for 20 to 30 seconds until it is hot and melted. Once the frosting is melted add in the 2 tsp cream of tater and stir thoroughly, pour 3/4 of frosting over the baking chips and let the heat from the melted frosting melt the baking chips. Stir until all baking chips are melted. With remaining melted frosting add 2 heaping teaspoons of cinnamon sugar and stir until blended. Pour 1/2 of fudge into into foil lined pan and spread outevenly. Pour cinnamon frosting mixture over fudge in the pan and spread over entire surface of the fudge. Pour the remaining fudge over top of the cinnamon sugar layer and spread out evenly. Sprinkle with remaining cinnamon sugar and pat into fudge. 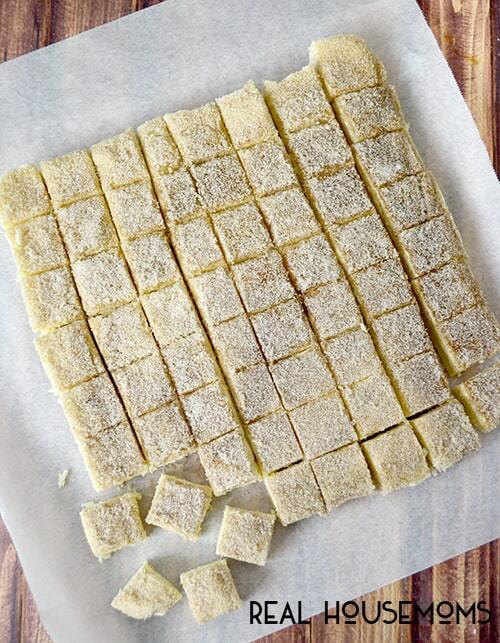 Let set up then cut into one inch squares. Enjoy! If your looking for more easy fudge recipes you might like these! Do these need to be stored in the fridge? How many days would you say they’ll be good for?